In this time of expanding awareness, newly discovered Angel crystals are gracing us with their divine presence. Angels are offering these beautiful crystals to you so you can channel their angelic guidance safely and tune in to their messages easily and with confidence. Angel crystals truly are the Avatars of the Angels. Gemstones such as Angelite, Selenite, Petalite, and Celestite are being used to help us attune to higher states of spiritual consciousness, especially the angelic realms. Petalite gently creates a clear dimension for the purpose of meditation, helping us to achieve an uncluttered mind. (I definitely need this one !). The pure and powerful vibration of Danburite is grounding, and activates the intellect helping us attune to higher consciousness. Charoite grounds cosmic energies, and is said to be empowering and transforming. (This one sounds really exciting, and its beautifull too !). And Angelite, (love that name) for telepathic communication and aligning with angels, divine beings and etheric bodies. There is an old saying that “the master arrives when the student is ready”. And so with these angel crystals, their discovery marks a time in our consciousness when we are able to embody the full light of our awareness, surpassing and transcending old beliefs which lower our vibration and block our spiritual growth. With these crystals you will learn to develop many ways of channelling angelic guidance and tune in to your Angel’s messages through dreams, meditation, feelings, visions and just by trusting your own intuition. They are also wonderfully safe tools and will protect you and others when you attune and dial into the angelic frequencies and develop your psychic senses on your holistic and loving spiritual quest. 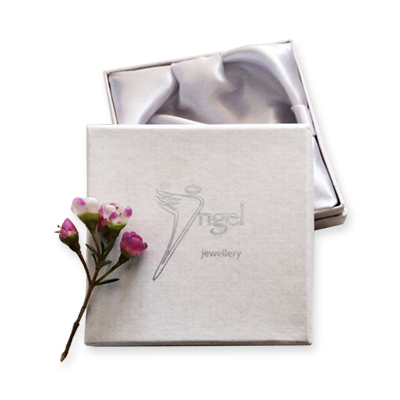 I will be using some of these new crystals in my Angel jewellery for sure, because I know that we will all, most certainly benefit from wearing and being energised and connected by the light and spirit of these beautifull stones.